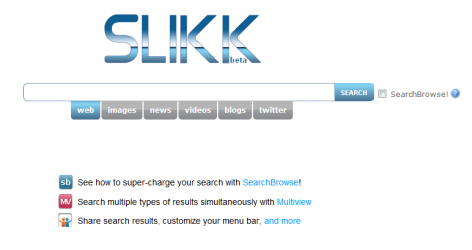 Slikk is a new search engine, that’s, well, slick. In beta, Slikk offers a number of features targeting towards both purposeful searching and serendipitous learning. Slikk initially presents you with this clean search page. As a default, Slikk will draw from Google to obtain initial search results though you can change select Yahoo/Bing by clicking on Options at the upper right side of any search results page displayed. You can change the content filter there as well. A particularly nice feature of Slikk is the Searchbrowse option, which will open up fully browsable website windows as you search, according to your preferences. You can automate this function via Options (applying it to the first three search results) or you can do this selectively. To be selective, just click on the blue Open button by any search result and the website for that particular search result will open up. You can control the size of the website to fit your preferences. The Lion View (LionV) will cause the display to fit your whole window. If you have multiple websites open, using the LionV button will arrange and present all your chosen websites on the screen at the same time. In the figure above, I’ve set my view to quarter screen. Slikk is all about user efficiency. Another feature, Multiview, allows you to perform multiple types of searches at the same time (e.g., any two combinations of web, images, news, videos, blogs, and Twitter). The image below shows a web and video multisearch. Like the result you’ve gotten? Share it to Facebook or Twitter. You can also add it to your own collection using the my button. In my hands, the my button was a bit buggy, at least when it came to trying to retrieve what I’d collected, but this is in beta (and it just launched in April), so odds are this will improve. 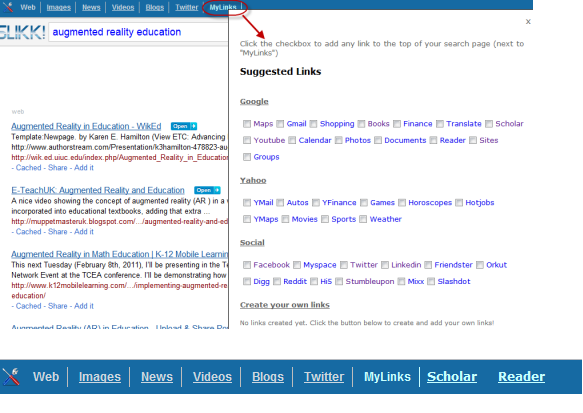 You can add additional navigational links by using MyLinks at the top of the screen. You’ll get a variety of suggested options but you can also add links of your own choosing. To start, I’ve added some of the suggested options, Google Scholar and Google Reader, to my list of search options. To learn more about the features of Slikk, take a look at this article and keep an eye on the Slikk blog. In research mode, you typically have both a keyword searching mindset and a browsing mindset. Slikk accommodates both. This makes literature searches, and content development much more efficient. I really like the autonomy Slikk provides. If you’ve read this blog, you know I’m a fan of exploring multiple search engines. 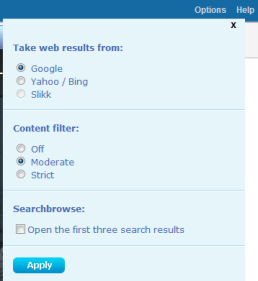 Slikk’s definitely going on my search engine Symballoo web mix.